Aquaman #36, by writer Dan Abnett, artist Riccardo Federici, and colorist Sunny Gho, continues to tell the story of Aquaman’s attack on King Rath as he tries to save the Kingdom of Atlantis from the power-mad monarch. Finally, after one too many issues, this arc comes to a head as everything pays off, from an actual confrontation between Aquaman and Rath to the mad king finally becoming a worthy foe for our hero. The character work for Aquaman is subtle, but very well handled by Abnett in this issue. In the previous chapter, Arthur and Murk, the captain of the royal guard, decided to team up to take Rath down, and this issue continues as they make their way to him. The magic of Aquaman’s character is put on display when Murk tells Arthur that he intends to kill Rath. Aquaman seems reluctant to go along with that plan, and it makes perfect sense for his character. Arthur has forever been caught between his identity as a king and his duties as a hero. As a king, he has to do what’s best for Atlantis, even if it’s not always the most heroic thing to do. As a hero, he tries to live up to the ideals that his colleagues, like Superman and Batman, hold themselves to: i.e. no killing. When Murk suggests killing Rath, it’s arguably the right thing to do, especially given the dire situation the kingdom is in with him on the throne. But Arthur resists that idea, because of his ideals as a hero. Those two sides are constantly butting up against each other, and Abnett has a perfect handle on both of them. This is also the issue where Rath becomes the interesting character that readers can sink their teeth into. Since his debut, he has seemed more like an annoying nuisance that somehow stole the throne from Aquaman. He was a ruthless dictator with a penchant for magic, but he hardly seemed like a worthy opponent for Arthur...until now. 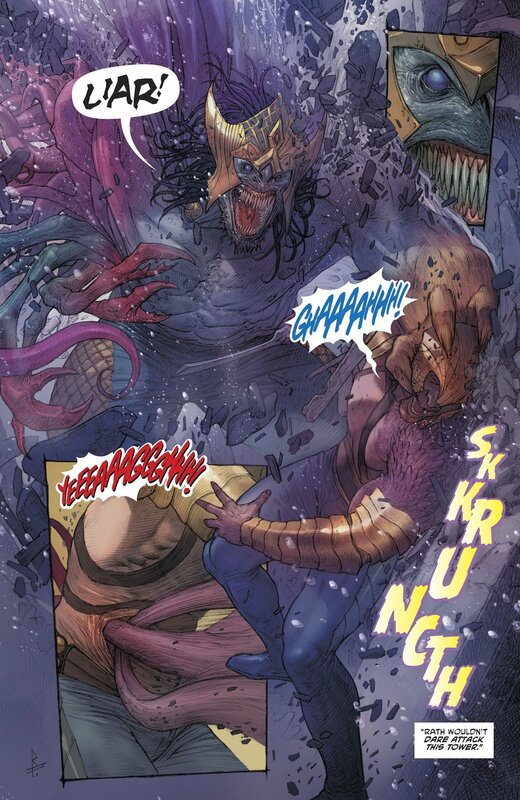 Essentially selling his soul to dark magic, Rath has become a horrifying monster of immense power, and the readers now have to wonder if Aquaman is enough to stop him. If this was the planned path for Rath all along, kudos to Abnett for the swerve. If not, congratulations to Abnett for realizing his villain needed something more and course-correcting. Finally, readers have an antagonist they might actually want to stick around past this storyline. The art by Riccardo Federici was great, as usual. He does underwater action (a must for Aquaman) with great skill, and manages to make every action scene seem like a revelation, as each character’s weightlessness is incorporated into their fighting style. Federici also does a wonderful job with character design, making even a potentially cheesy figure like King Shark seem cool and menacing. The colors by Sunny Gho also stand out, as they blend the illumination of magic and the darkness of the sea together in a beautiful palette that is entirely unique to this book. Hopefully, this title can hang onto Gho for a long time. Despite this issue being one more chapter in an overly-long story arc, the pacing is picking up nicely, and Rath has finally become a serious threat, so it’s definitely enjoyable. If you’re at all interested in the fate of Aquaman now that he has agreed to hand the throne over to Mera, or you just like great art, you should definitely be picking up this series. There is plenty of good story ahead.